Rather than the standard pitchside advertising hoarding or square-inch advert in the match programme, Brazilian Serie B side Vitoria have conjured up an ingenious way of promoting the club’s blood donation campaign. 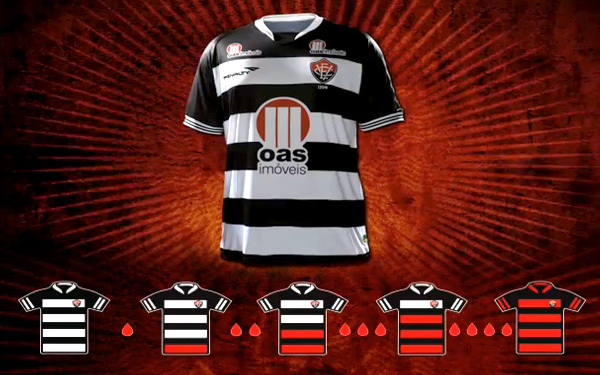 Nicknamed the ‘Red and Blacks’, there’s no prizes for guessing what colours Vitoria usually play in. However, ahead of the new season, the club have ‘drained’ the red hoops from their home strip in a bid to raise awareness and get their fans to donate blood for transfusions and the like. Nice idea. Makes a change from seeing either amazing skill or a mass brawl from South America. Very good idea on the part of someone at Vitoria. Alas, it’s all in vein! This campaign is working…. 46% increase on blood donation at Salvador, third cuty of country, Largest one after São Paulo and Rio de Janeiro.